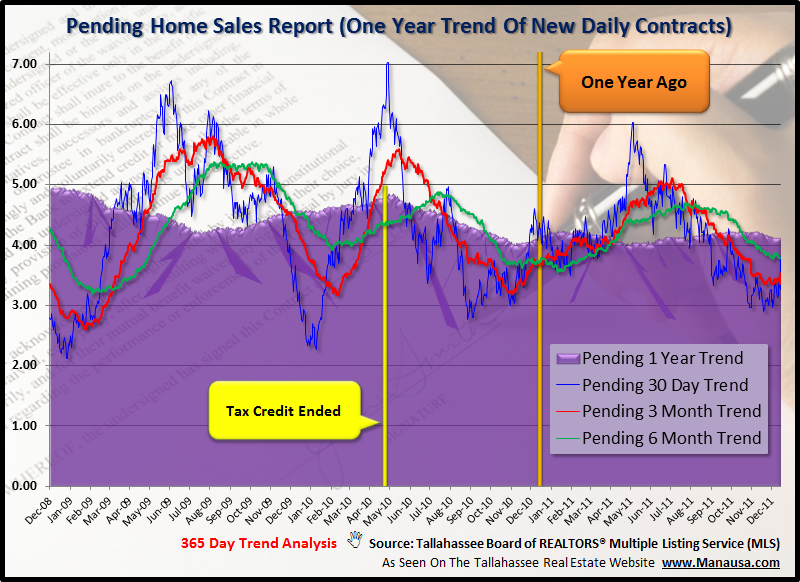 If you study new contracts in the Tallahassee MLS every day, and plot their performance over time, you often are able to produce short-term forecasts for home sales that are relatively accurate. With that in mind, the pending home sales report (new contracts) is projecting a slower 1st Quarter for 2012 than we saw in 2011. 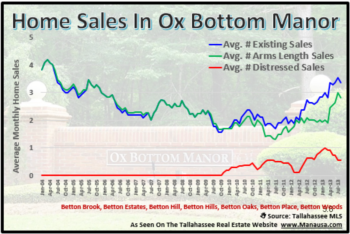 The following real estate graph measures long and short term trends for pending home sales in the Tallahassee housing market. The short term trend analysis usually gives us a glimpse at what the long-term trend will be doing in the next few weeks and months. The longest trend in the graph above is the one year trend, represented by the purple shaded field. Currently, this trend of average new contracts written each day is falling (meaning fewer number of new contracts each day). The 6 month trend is shown in green, and it is also on the decline, measuring at a number very similar with what it was recording at this time last year. The red line shows the 3 month trend (average number of new contracts each day over the past 90 days), and it appears to be on the rise, but at a level lower than it was last year at this time. Finally, the blue line shows the average number of contracts over the past thirty days, and while it is on the rise, it is 25% lower than a year ago. Unless January brings about a rush of heightened homebuyer activity, we should brace for a slower first quarter in 2012. Home sales usually mirror the pending home sales graph, but with a 30 day lag. 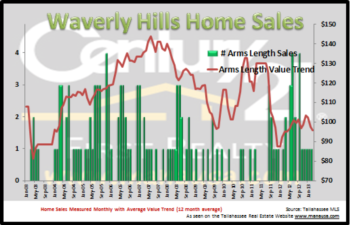 Our current one year trend of new contracts started to decline on November 10th, and the subsequent decline of the closed home sales trend occurred on December 10th. Home sellers should prepare themselves for few showings and less motivated buyers. Homebuyers are looking for value, and only those sellers offering value will leave the first quarter with success. If you have a home to sell, you should ensure that you use the most aggressive targeted marketing plan for real estate to ensure that you reach the majority of people who might want to buy your home.